Sales of bullion five ounce 2014 Arches silver coins for investors kicked off Monday, June 9, the same day Arches National Park quarters entered circulation and three days before the numismatic version of the silver coin debuts. Officially dubbed the 2014 Arches National Park Five Ounce Silver Bullion Coin and from the America the Beautiful Five Ounce Silver Bullion Coin series, United States Mint authorized distributors ordered 5,500 on the first day. On top of the going rate of silver, this small group of distributors pay a premium of $9.75 per coin. In turn, distributors resell the silver coins to dealers and/or directly to the public. Consumers can now pre-order them for a few dollars over spot. These bullion silver coins have a brilliant finish and no mintmark. In contrast, the numismatic version that goes on sale Thursday has an uncirculated finish and a "P" mint mark. While prices of the bullion coins change daily with silver, the U.S. Mint will sell the collectible uncirculated coin to the public for $154.95. 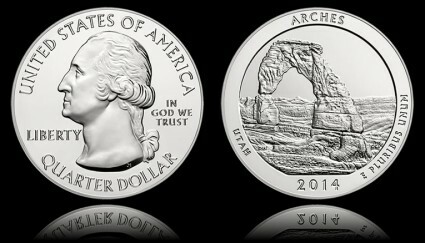 Both silver coins share designs that are on Arches quarters, with the main feature being a depiction of the park’s Delicate Arch. The two silver coins, unlike the quarters, have a flat edge with letterings denoting their 99.9% silver finesse. Within their respective America the Beautiful five ounce series, these are the third of five silver coins for 2014 and the 23rd overall. Already issued this year are coins depicting Great Smoky Mountains National Park and Shenandoah National Park. On the horizon are coins celebrating Great Sand Dunes National Park and Everglades National Park. These four parks are located in the states of Tennessee, Virginia, Colorado and Florida. Arches National Park is in Utah. Here is a table of sales as of Monday, June 9, for all released America the Beautiful Five Ounce Bullion Silver Coins. Those with a "*" have sold out. The U.S. Mint has indicated that it will strike bullion silver coins to meet demand. On Monday, the United States Mint also started selling bags and rolls of Arches quarters.